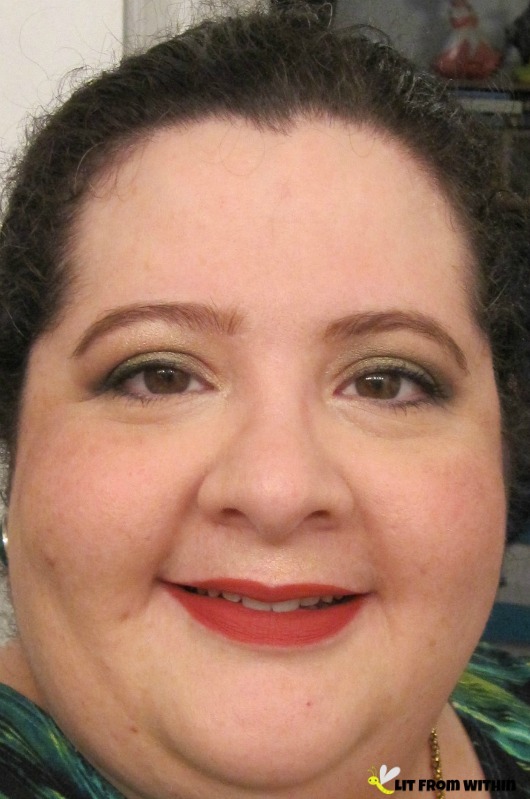 I was also feeling a little rebellious because I paired this look with Colour Pop Ultra Matte Lippie in Bumble, a rich and bright terracotta color. Colour Pop has really outdone themselves with these lippies. So pigmented, so long-lasting. At $6 each, everyone needs at least one. I swatched the Makeup Geek Foiled shadows that I have a while back, so you can check them out here, if you like. I love how the yellow-green of Jester brings out the yellow in my dress. I darkened up the outer corner with Houdini, and used some of the Catrice metallics on the inner corner for some golden glow. Products used: Makeup Geek Foiled and Catrice Metallics, Clinique Cheek Pop in Cola Pop, It Cosmetics Celebration Foundation Illumination in Light, ByeBye Under Eye Waterproof Concealer, ByeBye Pores Pressed Translucent Powder, and Brow Power in Universal Taupe, Becca x Jaclyn Hill Champagne Pop, YSL Blur Primer, Elf Undereye setting powder, Bare Minerals Big and Bright Eyeliner in Midnight, UD Perversion mascara, and Colour Pop Ultra Matte in Bumble. Not pictured, but I know I used eyelid primer. Probably Milani's. I used the dry-brush-grunge nailart technique to create this patchy/striped nailart. I was trying to evoke the pattern of the dress. What do you think? It was also pretty easy, and something I could recreate on my right hand without too much trouble. I love that all the nails aren't exactly the same, but they're similar. Bottle shot: White (mix of different whites), Zoya Pippa, Butter London Sozzled, and Sally Hansen Salon Dark Knight. I think I picked up that Elephant necklace on Groupon. I love it! Do I have a jungle vibe going? Maybe a Suburban Jungle vibe, more like?